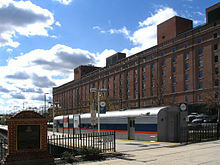 The B&O Warehouse is a building in Baltimore, Maryland, adjacent to Oriole Park at Camden Yards. It was constructed by the Baltimore and Ohio Railroad (B&O) beginning in 1899, with later sections completed in 1905, adjacent to the B&O's Camden Station and freight yard at Camden and Eutaw streets. Often purported to be the longest brick building on the East Coast, the 1,116-foot (340 m) long, eight-story brick structure had 430,000 square feet (almost 40,000 m²) of floor space for merchandise storage and distribution, large enough to hold 1,000 carloads of freight at a time, the B&O advertised. Railroad historian Herbert H. Harwood proclaimed it an "awesome structure ... a truly classic turn-of-the-century railroad warehouse." The warehouse was used by the B&O through the 1960s but was mostly vacant by the 1970s due to the use of trucks and newer, more efficient single-floor warehouses located in industrial parks elsewhere. With the development of the downtown stadium for the Orioles, which opened in 1992, the former B&O warehouse was converted to team offices, team spaces, and a private club for the Orioles. It is also used for private wedding receptions. In the entire history of Camden Yards, Ken Griffey Jr., has been the only player to hit the warehouse with a home run. He did so in the 1993 MLB Home Run Derby, in which he tied Juan González before losing in a playoff. No player has accomplished the feat in a game. ^ Herbert H. Harwood, Jr., Impossible Challenge. Baltimore, Md. : Bernard, Roberts and Co., 1979 (ISBN 0-934118-17-5), p. 150. ^ Stephen J. Salamon, David P. Oroszi, and David P. Ori, Baltimore and Ohio – Reflections of the Capitol Dome. Silver Spring, Md. : Old Line Graphics, 1993 (ISBN 1-879314-08-8), pp. 26–29.